The Championships rapper also talked about getting nice at ping pong while in jail. On Tuesday night, Meek Mill stopped by The Daily Show with Trevor Noah while finishing up his Championships victory lap. Watch the interview up above. In the 15-minute clip, Meek continues his run of heavily advocating for criminal justice reform through his own personal experience of being falsely imprisoned. Meek also gives a look at his nearly six month time behind bars from a more positive perspective, telling the host that he read books, learned how to play chess, and advanced his ping-pong game. 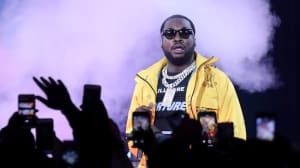 Early this week, Meek's Championships topped the Billboard 200 chart, selling 229,000 album equivalent units in its debut week. The album was released on November 30 and features appearances from JAY-Z, Drake, Rick Ross, and Young Thug among others.